On the Argentine side of the Patagonian Andes, the Chaltén Massif is a dense range of extremely steep mountains, famous for Cerro Torre and Chaltén itself (the native name for the peak also known as Fitz Roy). I have been coming to this mountain range on an annual basis since 2003, often for a three-month stay. In total, I have spent three years of my life in Chaltén, and have done a huge portion of my best climbing achievements there. The following is a little photo essay about my most recent season—this past December, January and February. Most of the climbing I did this year was with Austin Siadak, a fellow Seattleite who is a few years younger than me and has been very active in the Chaltén Massif for the past few years. In addition to being super motivated and a strong climber, Austin is a professional photographer. Thus, the more spectacular photos that follow are his! For the months prior to my Patagonia season, I was rock climbing exclusively. Dedicating myself to one discipline was great for getting in really good rock climbing fitness—I managed to send my first 5.13d—but I arrived in Patagonia less fit than normal for big days in the mountains. My first day in the mountains of Patagonia, Austin and I did a big hike into the Torre Valley to check on conditions and deposit some equipment. The mountains were plastered in snow and the last portion of our hike was through knee-deep snow—far from ideal climbing conditions. More unfortunate, on the hike back to town I had IT-band tendonitis flare up in my knee, an overuse injury that has been nagging me for the past year and a half. It was almost certainly the result of doing a big mountain day off the couch. The approaches in Patagonia involve huge amounts of elevation gain. Suddenly, I wasn’t sure if I could climb in Patagonia at a level that would be exciting for me. The first climb that Austin and I did this season was Aguja Val Biois—one of many peaks in the Chaltén Massif that are nearly unheard of, and only have a few previous ascents despite being spectacular mountains that would be famous if located anywhere in the contiguous United States. During a brief spell of clear weather between storms, we waded through deep snow on the approach and climbed the entire peak in crampons, even though much of the terrain would’ve been great rock climbing in drier conditions. To aid my sensitive IT band, Austin took more than his share of weight while hiking—a gesture that I appreciated greatly. To further reduce the chances of inflammation, we decided to sleep one more night in the mountains after our ascent, before the grueling hike out. Unfortunately, this decision coincided with my mother’s one-week visit to El Chaltén. By the time we arrived back in town she was getting ready to call a rescue! The second chance that Austin and I had for alpine climbing was again a very brief spell of clear, calm weather. Without enough time to try something bigger, we headed up on the north face of Aguja Guillaumet, one of the most accessible faces in the range. Usually when alpine climbing I am searching for intense, uncontrived experiences. I like to pit myself against objectives big and hard enough that simply getting up them quickly feels challenging. Often in the mountains, I am climbing in a style of maximum efficiency—mostly free climbing but also pulling on a piece of gear here or there when it seems faster. Thus, when we found ourselves on a relatively small climb, I decided it would be a nice place to play the free-climbing game. Austin and I climbed up a line that looked good to us (which I later learned was a variation of a route called Carlo) and had some exciting and athletic moments of hard 5.11. However, by the time we reached the junction of the Amy route, the peak’s standard route of ascent, the wind had become incredibly strong and we had to turn around without reaching the summit. Another brief spell of good weather came on January 20. Austin and I headed to a route on the west face of Aguja de l’S called Thaw’s not Houlding Wright. The route itself is as big as El Capitan, but due to the short weather window Austin and I decided to try it town-to-town, which involves a huge amount of hiking as well. We played the free-climbing game again and on some of the harder bits, like where this photo was taken, I regretted the decision of climbing on a single half-rope (a rope that is lighter weight, but with a lower safety margin). This is Austin climbing the last moves to the summit of Aguja de l’S, in the last rays of sunlight, after a fast and fun ascent of Thaw’s not Houlding Wright. It was dark not long after taking this photo, but not when we arrived in town—a long and brutal nocturnal hike out ensued, complicated by a midnight crossing of a raging river above big cliffs. Despite arriving in town super tired and with quite sore feet, I was happy because we had done a massive day without my IT band ever hurting. Only after this climb was I confident that it wouldn’t affect the rest of my Patagonia season. This is a photo of myself and Rolando Garibotti. Austin took this photo before another foray into the mountains, when Rolo gave us a lift to the trailhead in his pickup. The impetus for the photo was that it was the 10-year anniversary of the first ascent of the Torre Traverse, a climb that Rolo and I did together in late January 2008. The Torre Traverse was a climb that literally changed my life, and Rolo has been my most helpful and influential mentor in climbing. In the past several years, our climbing goals have taken diverging paths but we remain great friends. As you might be slowly gleaning, the weather was not very good this past summer season in Patagonia. However, getting good luck or bad luck with the weather is simply part of the activity of climbing mountains, and there is no point in getting bummed out about it. One can always make the most of what one gets. While I was in Patagonia this season there were only two spells of good weather longer than 24 hours. Both were preceded by lots of stormy weather so conditions on the faces were not very good. When a two-day window finally materialized at the end of January, Austin and I made the risky decision of sitting out the first day of good weather, hoping the conditions would improve for one big day of climbing. On the second day, we headed to the Afanassieff Ridge on the west face of Chaltén. There is no climbing on the route that is very severe but it is the biggest route on Chaltén and had never been climbed in a day before. This photo was taken about one quarter of the way up the route, right when we started to encounter significant amounts of verglas on the rock—tricky conditions that slowed us down considerably. This is Austin ambling along the last section of ridge to the summit of Chaltén. Despite the conditions not being very good, Austin and I climbed the Afanassieff route nearly as fast as we could, arriving on the summit of Chaltén roughly ten and a half hours after starting the route. In the background of this photo is the Cerro Torre group, and beyond it the Southern Patagonian Ice Cap. One thing that has always amazed me about the Chaltén Massif is how dramatic the climatic gradient is over such a short distance. To the immediate east of the spires are rolling pampas (Patagonian desert, essentially) and to the immediate west are humongous glaciers. In most of the world’s mountain ranges, it is typical to climb up the steep, technical side of a mountain and then descend the less steep side with a bunch of advanced downhill walking and perhaps some rappelling. 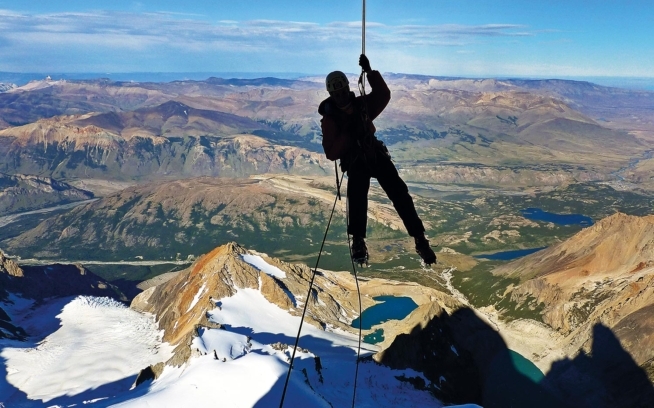 In the Chaltén Massif the peaks are steep on all sides, so there are almost no easy descents and climbing in these mountains is a master class in alpine rappelling. After climbing the Afanassieff route, Austin and I descended Chaltén by the French route which is the most commonly descended route. About a third of the way down, our rope got stuck while pulling it. Here, Austin is embarking on the task that no one likes: retrieving a stuck rappel rope (he was belayed and placing protection). The success that I’ve had as an alpine climber is, without a doubt, the result of a singular dedication over the majority of my life. I could not have achieved what I have achieved had I not made major sacrifices in other aspects of my life, including my education, my financial security, spending time with my family and my relationships with friends and lovers. One year ago, I met the most attractive woman I’ve ever encountered and my life has become more complicated. I still want to pursue my climbing goals with total dedication but now I share my life experience with someone I know is too good to ever risk losing. Like most things in life, it’s a balancing act and part of that act was for Alisa to come to Patagonia with me for the entirety of my time there this season—a generous act considering she has no interest in alpine climbing. When the weather wasn’t good enough for me to go alpine climbing we went hiking or sport climbing together. Here she is enjoying some of the local sport climbing. 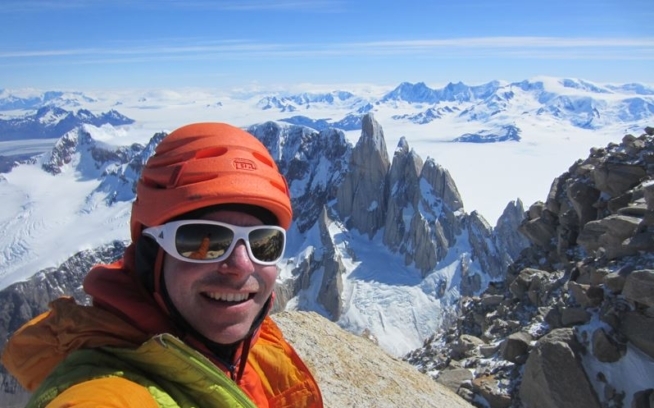 During yet another spell of weather nice enough to go alpine climbing but too brief to attempt a big route, Austin and I headed to Aguja Pollone—a slender spire that I had always admired, but not yet climbed. Two other friends from Seattle had just arrived, Andy Wyatt and Nathan Hadley, so we climbed in party style: Andy and myself on one rope, Austin and Nathan on another, but rappelling all together. The route La Granja had excellent climbing and we all enjoyed ourselves a ton. One of the last successful climbs of my Patagonia season was Aguja Kakito, another big town-to-town day with Austin. Like Aguja Val Biois, Aguja Kakito is one of those spires in the Chaltén Massif that receives very little attention because of its more famous neighbors. In fact, we made the second ascent! I like this photo because I think it helps people appreciate the scale and complexity of Patagonian climbing. Even though the granite looks similar up close, the experience of climbing in Patagonia is drastically different from someplace like the Sierra Nevada. The point where we started hiking in the early morning is much lower than the lakes you can see in the background of this photo, and the 60-degree ice slope to get up to La Brecha is big enough that Austin appears as hardly more than a speck—and that’s all just to get to the start of the climb itself! Rather than take the easiest or most direct route to the summit of Aguja Kakito, Austin and I climbed the section of ridge starting from La Brecha that Tommy Caldwell and Alex Honnold pioneered during their first ascent of the Fitz Traverse. It was mostly moderate climbing but on superb quality rock. We weren’t complaining that it wasn’t hard. The entire day we were getting blasted by a freezing wind so we climbed everything wearing two puffy jackets each. Here Austin climbs the last bit of rock up to the summit of Punta Kellogg, on the way to Aguja Kakito. This small summit was named after Chad Kellogg, a friend and fellow Seattle climber who died a few years ago while climbing on Chaltén. I was happy to visit the summit named for my friend. Even though it is a tragic memory, it is good to be reminded often of the real dangers of climbing mountains, to keep us on our toes and making decisions as safely as we can.